3-0 Pakistan BUT What Next? Pakistan have sealed the ODI series (3-0) in Barbados yesterday. 2 dead rubbers are to follow in due course. Pakistan have also successfully defeated the West Indies in 2005 during their tour of the Caribbean then 3-0 and there was an identical score line in 2008 during a home series played in the United Arab Emirates. During West Indies tour of Pakistan in 2006 they also ended up losing the ODI series 3-1 with one match affected by rain. Pakistan continues to demonstrate their dominance over the West Indies in ODIs played this decade. The last time West Indies defeated their current sub continental visitors was during a preliminary group fixture in the 2007 World Cup. West Indies have now lost 8 consecutive ODIs against Pakistan who have won 12 out of their last 15 ODIs played this year which includes an ODI series victory in New Zealand after 17 years, a 6th appearance in a World Cup semi final and now a series victory against the West Indies in the Caribbean with 2 games to spare & a whitewash on the cards. Today is also their 13th victory overall across all formats this year within 20 encounters which was the total sum of victories across all formats in 2010 with the exception of 13 victories coming in 45 encounters during that calendar year. This evidently goes to reflect how the fortunes of the team have changed in 2011 in comparison to the horrific year of 2010 which was dominated by a mixture of on field woefulness & uncountable controversies which put the state of Pakistan Cricket in absolute disarray. The manner in which they have fought back, surprised many & rejuvenated their spirits and performances has been all but admirable & now they are beginning to make some confident positive forward strides after losing a large segment of their fan base rather rapidly in 2010. I am looking forward to the remainder of the tour with the focus on the 2 Tests which are to be held in Guyana and St Kitts respectively & provide a golden opportunity to create some history & claim some significant silverware & a potential rise in the rankings. The whole red cherry episode gets under way on the 12th of May. Pakistan will enter the series having lost only 1 out of their last 4 Test series contested & an undefeated record under their current skipper. In short, well done for now, but a lot of hard work lies ahead with tougher assignments to follow. Nonetheless, the fan base should be confident. The batting line up in the test arena is looking strong, compact, dependable & consistent of reaching 120+ over mark to post competitive scores (320-350+) & keep everything under control & in full command, showing fighting resilience to play out long sessions and come back hard from behind as well as making the opposition genuinely sweat/frustrated with the level of application, temperament & occupational resilience from the top 6 which has been a revelation: Hafeez, Taufiq, Azhar, Younis, Misbah, Asad . They will enjoy themselves on the flat pitches against a lacklustre bowling attack and are bound to do well if they play as they have been doing. Spin will be a crucial area considering West Indies struggles and the nature of the pitches & this is an area where West Indies can be made to sink after runs have been piled up. Ajmal will hold the “X” factor with the ball. The pace attack is certainly workable with the likes of Umar Gul & Wahab Riaz who are continuously growing in stature. He should have batted at 4 in WC too. The solid batter HAS to be in the top 4. Mohali could have been a different story had Afridi and the management utilised him properly. Prevents pressure building up in the first place. Helps him command the game forward from the front and make a bigger impact as a top class experienced batter. Finally Misbah batted at 4 today. Soild anchor role accumulators who are capable of playing a long innings batting in the top 4 is key to maximise the effectiveness of both them and the team i.e. Trott and Kallis as examples. It is easier to make a bigger impact with more time and responsibility & build the innings that way. The legendary Imran Khan had stressed this point throughout his TV analysis in the World Cup & felt this was a key area why Pakistan were never able to play to their full potential and eventually went on to lose the all important clash on Wednesday 30th March 2011 as the guy pictured was left as an alone warrior with too much to do with too little time. -Yesterday was exactly a month since the West Indies were outplayed in the 1st quarter final match up played in Dhaka by a humiliating 10 wicket margin. A month later it was the 1st ODI of a 5 match series held in the Caribbean and the outcome was similar. Pakistan outclassed them and eased to victory but this time by a margin of 8 wickets following an unbeaten 134* run 3rd wicket stand between emerging Shafiq and experienced Misbah. -Pakistan have bowled first in their last 7 LO encounters and chased down the target successfully on 4 occasions. -Pakistan have won their 6th consecutive ODI against the West Indies overall. -The spinners just went for 100 runs in their 30 overs: Hafeez, Ajmal, Afridi whereas the left arm pacers went for 111 in their 20 overs: Wahab, Junaid. -Wahab Riaz bowled 11 wides and 3 no balls in his 10 overs. It was a complete lack of discipline & control from the left arm seamer who sprayed it about all over the place. 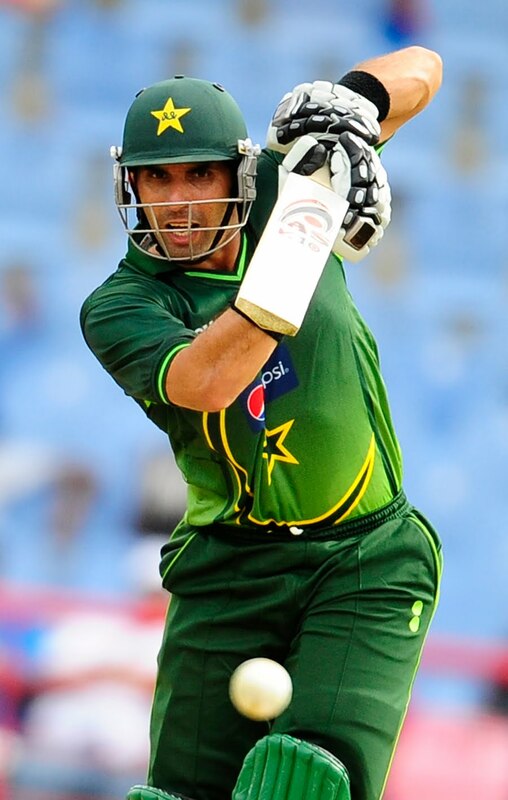 -Misbah has scored 6 half centuries in 12 ODI innings this year. 4 of them have come in winning causes & on 3 occasions he has carried the bat through. Misbah reached his 15th ODI half century. 11 of those have come in winning causes. -There were 3 half centuries in the top 4. Hafeez reached his 9th ODI half century whereas Shafiq reached his 3rd. -After claiming 21 wickets in the space of 7 matches Afridi has gone wicketless for the last 3 LO encounters. -Hammad Azam did not get a chance to turn his arm over or bat on his ODI debut. -1,13, 12,10, 8, 22 are the scores of Ahmed Shehzad in his last 6 ODI innings. In order to keep his place in the national side he simply needs to get his act together and start performing. There might even be a temptation to drop him now and replace him with Pakistan's current Test left hand opener in Taufiq Umar who is part of the 16 man squad on this ODI trip. -Junaid Khan bowled well in his first spell and generally impressed Michael Holding with his action and follow through. He conceded 23 runs in his first 6 overs & did a pretty good job. He seems to be able to move the ball appreciably away from the right hander and jag it into the left handers. There were some encouraging signs from a player who would have been nervous. 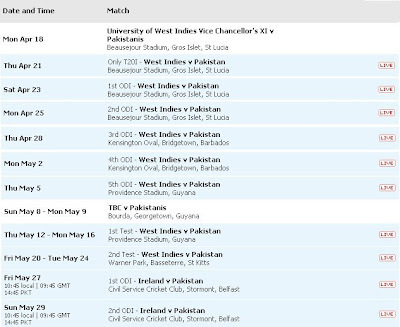 -In 2010 Pakistan won 5 ODIs in the calendar year out of 18 encounters. 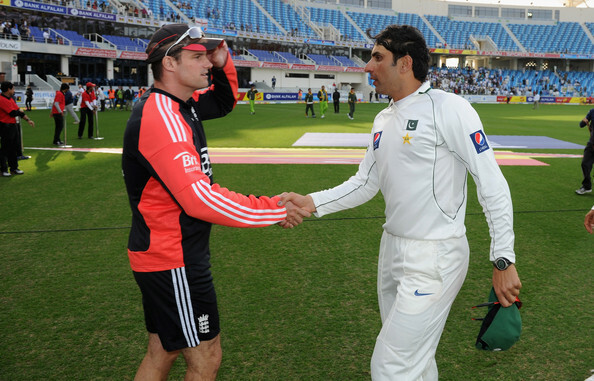 Misbah was not part of the team with the exception of 2 matches. In 2011 Pakistan have already won 10 ODIs out of 13 he has played in. Since coming into the side this is the difference and impact he has made to the ODI side. The change in fortunes his stature and presence has brought in the side speaks for itself. On current form he is up there amongst one of the best batsmen in the world right now. The New Zealand coach was insisting to his players :" we should learn how to bat like Misbah and take a leaf out of his book." It's pure ignorance to degrade his credentials and role in the LO side at this moment in time. Hard to add anything constructive considering it was a Twenty20 match & it was his first game. He produced some good deliveries on a challenging spot & passed the edge on a few occasions. Break it down. Only conceded 2 boundaries in 12 deliveries from a batsmen who took most of the bowlers to the cleaners. 3 runs only from the other 9 balls. Decent & respectable start to hopefully a long and prosperous career. The action was smooth. Pace was pretty good. Tipping him to take 5 or 6 wickets in the 5 match ODI series which commences tomorrow. We will get a better indication of his promising potential then but for now a steady start indeed. Things I am Hoping to Witness In the Caribbean Tour. 1) Misbah Ul Haq captaining Pakistan to their first ever Test series win in the Caribbean. Main objective of the tour will be that. Misbah batting at 4 in ODIs and scoring his maiden ODI century. 2) Azhar Ali scoring his maiden Test century. 3) Mohammad Salman performing well as Pakistan's premier keeping option. 4) Wickets and runs for the mouth watering young beauty in Hammad Azam. 5) Junaid Khan bursting on to the scene and capturing the attention of the commentators. 6) Winning all 3 formats. 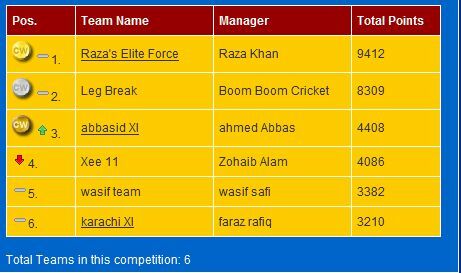 7) Winning approximately 6/8 of the fixtures overall across all formats. 8) Century from Ahmed Shehzad at some point during the series. 9) One of the youngsters getting the MOTS award in the ODI series i.e. Hammad, Junaid, Umar Akmal, Shehzad, Shafiq. 10) Wahab Riaz/Saeed Ajmal stepping up and leading the attack successfully as Pakistan's strike bowler in the ODIs. Should Afridi Be Sacked as T20 Captain? -Afridi has won 1 out of his last 8 T20s as captain & that win was a dead rubber against New Zealand on Thursday December 30th 2010 when the series was already lost. Generally a very poor record for a team who were former champions. -Since fully taking over the LO captaincy Afridi has won only 5/16 T20s as skipper including a gentle victory against Bangladesh. -Pakistan might be missing players like Malik and Mohammad Aamir in the Twenty20 format who were instrumental in the 2009 triumph, but today West Indies were missing their star players & still got the job done AND also during the New Zealand series the Kiwis were without Vettori and Brendon but still successfully defeated Pakistan 2-1. His personal performances in this format have not been up to the mark either & as matter of principle he has to take on the responsibility for the defeats being in the hot seat. In this format specifically the 3 key requirements to be successful are: selection, strategy and form. All of these are in the hands of the captain & he has to be held accountable. He is by far the worst T20 captain Pakistan have had by a country mile. How one wished in an ideal world we had a "Younis Khan" like champion captain right here and right now! He was strategically & tactically outstanding. From title holders to minnows. Will Pakistan enter the next T20 WC with a new captain? -Abdul Razzaq for T20 WC 2012. He will bat himself at number 3 guaranteed. He deserves the honour as a farewell. Razzaq is still part of the plans for T20 cricket. He wants to have a swansong next year. However, for ODIs he is finished. The T20 and ODI squad was announced together as one overall. Hence, he is not selected NOW but he is not totally out of contention. Think big! -Imran Nazir. Captained successfully domestically & if they really think out of the box who knows. -Misbah Ul Haq. Has captained once before in T20s internationally & Pakistan defeated Australia in the UAE. For the 2012 T20 WC he could be a very suitable & even idealistic choice to conclude his LO or even overall career. Afridi's T20 record as captain is abysmal. He might have been one of the best T20 players in the world at one point and key in Pakistan's success in this format but he has now been a key factor for the decline and terrible dip in T20 form. If Pakistan are serious about winning the next T20 WC they must make a change. You simply cannot expect to do well in the tournament when you're going in with such a poor record under the given leader. A fresh and bold change might just be the magical spark in fortunes which are required. There are several options available. A youngster could captain & be the wiser option as it is 20/20 after all and generally a stage for youngsters to settle, impress and grow. There are several choices who could walk in this team who have proven natural "captaincy material" from the youth and first class circuit. Why Misbah is still in the ODI Team! 1) Merit: First and foremost he was the leading run scorer in the ODI series against New Zealand and he was also the leading ODI run scorer for Pakistan in the 2011 ICC CWC. He has scored 5 half centuries in his last 11 innings. On ODI form alone his place cannot be questioned by any stretch of the imagination. 2) He has the Test Captaincy firmly in his hands. It always helps when the "real captain" or "major captain" of the national team is in and around the camp for the LO formats so he can keep a close eye on proceedings and share his vision, views and expertise with the management and LO captain. Therefore he should still play ODIs and T20s for however longer he remains captain of the Test team which should by another 2 years as he is building a strong looking side which is producing the desired outcomes. 3) Younis and Misbah were two class acts in whatever format they plan in and making drastic wholesale changes at once is not really the best way forward. You have to take one step at a time and keep a blend of experience and youth. You cannot really axe Younis Khan and Misbah Ul Haq simultaneously just like that. One needs to have at least one experienced batsmen around to help groom and encourage the youngsters and as Misbah has the leadership and superior form in his favour he unquestionably gets priority over Younis at the moment as far this role is concerned. 4) By playing in the LO formats it will help him keep his form, fitness and shape ahead of the Test Series which proceeds and which matters the most. A captain's performance and form accounts for a lot. Hence, if he is playing ODIs it could help the Test team gain as well. Tests have priority in a professional cricketing establishment. 5) Will help him adapt to the conditions ahead of the series which matters most. This should put him in good stead to deliver where and when it matters and look at some new faces from close up which he might be interested in seeing in his Test side for example. 6) Pakistan will struggle to bat 50 overs without an experienced soild anchor role batsmen in the middle order. This is the basic principle of ODI cricket, batting out your overs! 7) He is the Mr Cricket of Pakistan i.e. Mike Hussey of Australia who has a commanding presence at the crease and reads match situations exceedingly well and handles proceedings out there in the middle with a sense of authority, class and expertise. Misbah also has those capabilities as he has demonstrated in his relatively late and short career. Has Hussey retired from LO cricket? He is 35 after all. This is an example to refer to. 8) If a player is succeeding in Test Cricket he is more than good enough to succeed in relatively easier formats. Just a concept which tends to work out and more often than not is the reality. Some thoughts for consideration here, but to be honest Misbah was never really in serious contention to be axed from the ODI team in the first place and was probably even going to end up leading the side in all formats during the WI tour when Afridi decided he wanted to take rest and who knows maybe Misbah will end up captaining Pakistan in the 2012 ICC WT20 or something of the sort if Afridi is banned or fined as he has been in the past. Misbah certainly has the credentials to stand in whenever needed and do a top job. He is still in the LO side and good to see if you consider the situation with a sense of perspective and clarity. Pakistan have played 45 Twenty20 internationals but they have never played an international T20 encounter against the West Indies. Out of the 45 T20 internationals Pakistan have played they have won 27, however they have only won 1 in the last 7 they have played. Pakistan have lost the last 3 Twenty20 series they have played against England (2-0), South Africa (2-0) and New Zealand (2-1). West Indies on the other hand have played 28 T20 internationals and won 11. Last time Pakistan played in St Lucia the breath taking final over heroics from Mike Hussey shattered their dreams of reaching a 3rd consecutive Twenty20 World Cup final on Friday 14th May 2010 as the baggy greens successfully chased down 192 with 3 wickets and 1 ball to spare. During the 2010 ICC World Twenty20 Cup as a whole Pakistan played at the venue 4 times and won twice and lost twice. Saeed Ajmal is the leading wicket taker in international T20 matches at the venue with 9 of his scalps captured at this very venue. Pakistan have reached the T20 WC semi finals 3/3 times whereas the West Indies have only reached the semis one of the 3 times in 2009 where they were defeated by Sri Lanka who eventually went on to convincingly lose the final against Younis Khan's victorious Pakistan side. Pakistan have won 8/18 Twenty20 internationals in which Shahid Khan Afridi has led the side. 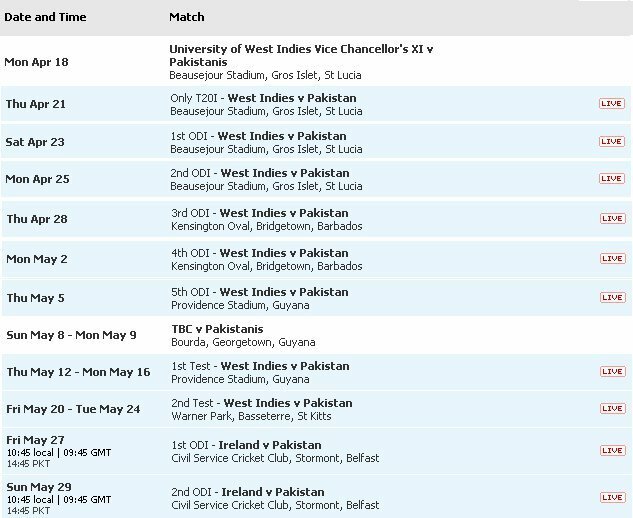 Prediction: Pakistan will win convincingly and start their preparation for winning the 2012 ICC WT20 which is to be held in Sri Lanka with a bang. For this match I expect to see 3 debutants including Hammad Azam, Mohammad Salman and Junaid Khan. The team as a whole will also go on to win all 3 formats on this tour which includes their first ever Test series win in the Caribbean under the leadership of Misbah Ul Haq. Winning the Test series and creating some history ultimately will be the main objective of the 8 match tour which all gets under way with this T20 encounter. Unearthing some young guns and discovering some top notch finds will be an area Waqar Younis will be focussing on too. I am tipping Hammad Azam and Junaid Khan specifically to do brilliantly and become the "next big name" in the eventful world of Pakistan Cricket. All in all its exiting times. Fans can expect good performances, but must be patient with the newcomers rather than being rushed into making any exaggerated judgement and calling for the recalls of past players if they happen to fail. A transition process can take time to develop and has the potential to pay off richly over time. All newcomers have admirable potential to do wonders for Pakistan cricket and go on to achieve plenty and replace some high achieving names, but expecting miracles from them straight away is unreasonable. Futuristic planning and sticking by the new faces is the best way forward. Lets bear in mind they have all reached where they are for a reason and obviously therefore possess some undiscovered credentials. Brilliant selection in my view. Hammad Azam, Usman Salahuddin, Aizaz Cheema and Mohammad Salman have been names that have been regularly mentioned on pages for a long time. Good to see them finally getting their chances. Good to see some brains prevailed. Dropping Misbah would have created chaos and plus you need a balance of experience and youth. Making wholesale changes can be disastrous. Misbah should continue to play all formats until the 2012 ICC World T20 as he has the Test Captaincy in his hands and his presence gives Pakistan Cricket much needed stability. He is key for grooming youngsters so once he does make way at least those youngsters will be properly groomed and can take over the responsibility. We need to plan towards the 2015 ICC World Cup but take a few steps at a time rather than rushing into things. Plus will keep him prepared and give him a chance to keep his form ahead of the Test Series which arguably should have priority. Always helps when the Test Captain is around the camp for the shorter formats. His form has been stupendous. You cannot drop/axe Younis and Misbah simultaneously just like that. Need at least one experienced batsmen to stick around to help newcomers and as Misbah is Test Captain he gets priority. Anything can happen in pressure. He was a key player for the team reaching the semis in the first place. Poor captaincy, no strategy in constructing the chase, drop catches and shot selection are to blame. Had Misbah batted at 3 or 4 and others were supporting him on the other end this could have turned out to have been a match winning effort. Using him at number 5 when the rate is climbing is not bound to get you anywhere. No innovation or flexibility from the skipper. Anyway, without his innings Pakistan would have lost by 60+ runs. One match does not make a bad player overnight. Afridi's erroneous captaincy was even worse than Misbah's innings that day otherwise it would have been a comfortable win. As expected Afridi's captaincy let Pakistan down in the bigger matches. He failed to take the kill and use his aggression in the field and completely set the wrong field to Sehwag. I re-inforced this exact point at the beginning of the tournament. Afridi's captaincy specifically was a huge area of concern and it turned out to be a downfall. Kamran Akmal, Razzaq and Younis Khan have been dropped for the ODI team. All of these moves are logical and totally understandable. However, Razzaq might play T20 cricket and obviously Younis Khan is automatically in the Test Side. However, this probably is the end of the road for the crooked and laughable tried and tested wicket keeper which is a sigh of relief in itself. There were also rumours of Farhat returning but as many will agree it was good to see that was prevented from happening. Taufiq Umar makes it to the ODI team as well. Now that Kamran is apparently dropped it is of utmost significance that Umar learns his lessons from the past and does not look to deliberately make room, give others a hard time and save his elder brother otherwise he could be punished by being dropped for good. Representing a nation is a privilege and honour and a right which cannot be abused. It is advisable that Umar only thinks about the team and his future and not worry where Kamran has ended up regardless. Whether he is utilised properly or not he ends up being a waste of space who performs once every now and then. His inclusion has been creating great fuss with the team composition they go in with as they don't have the brains to send him up the order and let's face it that he won't be batting up there anytime soon. Plus need to plan for the future and invest in more worthwhile options rather than carrying extra baggage to fill up the playing numbers. I sympathise with Razzaq with the way he has been treated but he has to go if we are to get anywhere. He should not be part of the ODI set up anymore. Maybe recall him for the next WT20 but nothing more than that. Waqar wanted him dropped for an extra fast bowler. That is some serious courage. If they are not going to use him properly they might as well drop him which he did. Dropping him is better than keeping him in the 11 to make up the numbers. At least he was decisive unlike Afridi who wanted him back in the team but still was reluctant to promote him up the order. He asked for rest. Good decision because of the workload he has done in recent times. He needed it as he has been playing all 3 formats with regularity. He will come back fresh and hard when he returns. It means Wahab will lead the attack and other bowlers can get some exposure in his absence. Umar Gul should return for the Test Series. I don't mind him skipping ODIs. Salman is apparently a hard hitting batsmen but many people are raising eyebrows at his selection over Safraz who has been performing better. Reports were suggesting Pakistan's 2006 Under 19 World Cup winning captain and young wicket keeper Safraz Ahmed will replace Kamran Akmal for the tour of the West Indies. Safraz is highly regarded by the likes of Rashid Latif who was probably the greatest Pakistani wicket keeper of all time. For those that might argue his batting is not good enough I recommend you check his recent stats and see his average was 164 during a domestic tournament!!! Anything but a change from the Fakmal mafia and shambles is a welcome relief for Pakistani Supporters who have been begging for Kamran's exclusion from the team. I agree on Shehzad. Let's not forgot his centuries in New Zealand and in one of the World Cup warm up fixtures. Also, scored a half century in the last T20 international he played. Failure in the WC should not mean he is totally axed long term. Even Younis Khan failed in WCs in 2003 but he went on to become one of the best players of this generation. We should not draw any conclusion regarding his future solely based on this WC performance. Aizaz Cheema has been a consistent and prolific bowler on the domestic circuit for a number of years and it has been surprising why he was not selected beforehand but's it's never too late and now he will receive the honour of an international cap. He is an impressive and experienced pacer who has been regularly running through sides and taking wickets. He played for PIA and was amongst the top 5 leading wicket takers in the 2010/11 QEA trophy. PIA were runners up during the tournament. He also played for Lahore Lions who are the current winners of the domestic T20 tournament. He also played in the 2010 Asian Games where Pakistan concluded with a 3rd place position after beating Sri Lanka in the play off. Cheema was part of the 30 man preliminary squad for the 2011 ICC Cricket World Cup as well. 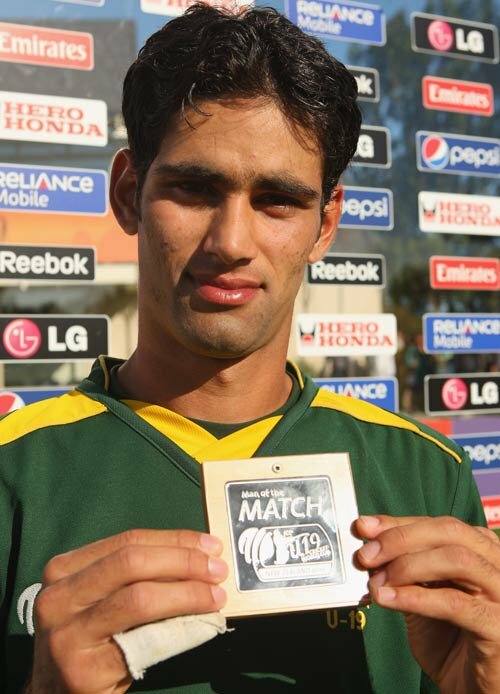 Sadaf Hussain has replaced unfit Aizaz Cheema in the 16 man squad for the tour of the West Indies T20 and ODIs teams. Sadaf is a 21 year left arm fast bowler who has taken 90 wickets in his first 18 FC matches. His bowling action is similar to India's Zaheer Khan. The long term replacement for Abdul Razzaq and one of the future stars of Pakistan cricket. NBP all rounder Hammad Azam has been named in the ODI team for the tour of the WI. He is a batting all rounder. He was part of the 2010 ICC WT20 squad but did not get a game. He was Pakistan's stand out performer during the 2010 ICC Under 19 WC where he scored an unbeaten 90 odd under pressure during the semi final. Generally regarded as a match winner and future gem. He was also the second leading wicket taker during the 2010 domestic T20 tournament with 8 wickets in 3 matches. Good to see him finally get selected. The timing is right. Recently he scored 3 half centuries in 7 50 over Matches to help NBP reach the final in the National One Day competition at a brilliant average of 70. He has a wide variety of shots and scoring options and has shown in A tours and in the U19 WC that he can carry the bat and handle match situations very maturely and responsibly. He has the capability to hit the ball a long way and clear the ropes by taking on a calculated risk if the situation requires. From my observations he is a flexible batting option who will have his good days and will fit in very nicely into this current ODI team. I was even optimistically pushing for his inclusion in the ODI team for the WC but that was not to be and as a matter of fact he did not even find a place in the preliminary 30 man squad. As far as his bowling goes he is a wicket taking option. He has pace and height and can move the ball but tends to be expensive and wayward as well. He played in English league cricket last year and got an opportunity to bowl in different conditions and a further opportunity to work on his bowling which seemed to pay off. Nonetheless, he is an exciting prospect and one that is bound to go far if he handles the intensity of international cricket and is given a good opportunity to show his worth. He is a tall young man from Attock with no shortage of talent or temperament. ‎1983 is repeated. India clinch the World Cup title in Mumbai. India are World Cup Champions. They have lived up to the pressure and expectation throughout. SRT is a true legend. MS Dhoni's captaincy has been instrumental. Adds to his impressive achievements. A day all Indians will remember for a long time to come. Congratulations to them. India have waited 28 years for this moment. Sri Lanka have waited 15. India got close in 2003 but failed at the final hurdle. Sri Lanka got close in 2007 but failed at the final hurdle. Both have seen Australia standing in their ways. After approximately 12 years we will have a new World Cup Champion. Either India or Sri Lanka? Two hosting nations battling it out for the big title! Which team will be the first of the Asian teams to win the World Cup twice to join the Australians and West Indies who also fall under this golden category currently? One thing is for sure. Only Australia, West Indies, India, Pakistan and Sri Lanka have won the World Cup previously and we will not have a brand new winner for the first time. Only one of the 5 teams which have already won it will lift it again. Tough luck England, South Africa and New Zealand who will have to wait another 4 years for the Australasian World Cup when another opportunity beckons. Neither of the other nations could accomplish their missions this time around either. Proportions: 50/50 (sitting on the fence) but I am tipping Sri Lanka and secretly rooting for them! I initially predicted India will lift the World Cup Title so it's a win/win situation either way! 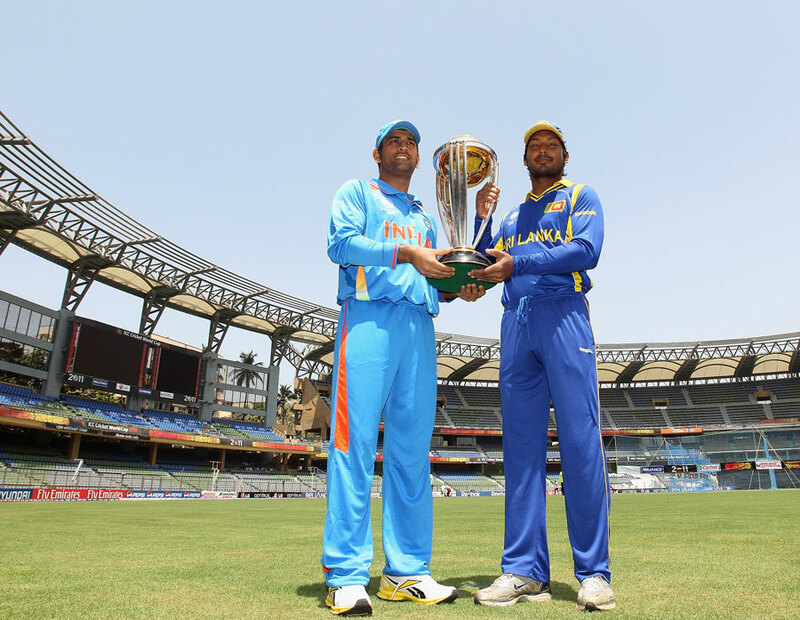 The teams have met 128 times in ODIs with India winning 67 and losing 50. Time for the big one. Time for "D" day. Time for the moment of truth. Time for a winner. Time for a runner run. Time for a player of the tournament. Time for a Murali farewell. Time for a Sachin dream. Get this damn game started! It was the biggest match he would have ever played in. It was a school boys dream. On a humungous day in Mohali the former Aitchison college pupil stole the headlines and captured the attention with his splendid left arm fast bowling exhibition. It was a mixture of skill and character. It was an admirable performance on the big stage. The legendary left arm great Wasim Akram was delighted for him and was regularly singing his praises during his commentary stints. One cannot emphasise the brilliance which was witnessed from the pacer. The figures undoubtedly speak for themselves. A champion made his mark on the world. The professor was the star of the show as the West Indies crumbled in Dhaka during the 1st quarter final match up. It was an outstanding all round performance from the opening batsmen and bowler in this instance who wrecked the West Indies with his credentials. He dismissed 2 left handers LBW during a 2 wicket maiden in the 6th over. He bowled exceedingly accurately and economically with his nagging trajectories. His bowling totally squeezed the opposition which earned him his full quota. Only going at 1.6 rpo certainly provides the picture. He followed this up with a beautiful well complied 61* to see his side over the line wicketless. His timing and placement was really pleasing to the eye as the professor regularly pounced on any given opportunity to find the gaps. It was an innings which included 10 boundaries. Consequently Pakistan emphatically marched into the semis and the professor virtually did it all by himself. Everything he turned to was converted into gold as he fired like an invincible prince during a do or die circumstance. This was Pakistan's highest individual score during the tournament and it was fittingly coming from Pakistan's highest run scorer, senior batsmen and vice captain during a monumental winning cause at the Premadasa against a well regarded side playing on home turf. An excellent contribution from the responsible cricketing braininess who lead by example and carried the bat when the situation required. An effort worth recognising. Defending 277 Pakistan's captain who had taken an astonishing 5/16 in the previous match against Kenya once more came to the party against a relatively strong batting line up in a tense match which was interestingly poised in Colombo after a brilliant first wicket stand from the Lankans. He claimed wickets at regular intervals with his variations and guile. During the process he also reached the milestone of 300 ODI wickets and that came with the dismissal of his opposite number and one of the most prolific run scorers in the tournament in Kumar Sangakara. After sitting out of the match against Zimbabwe Umar returned to the side on the 19th March to take on the Aussies in Colombo. Coming into bat at number 6 after two consecutive dismissals there would inevitably have been tension and nerves jangling on the youngster but he expressed himself with his flair and flamboyance including some superb shots against the ever fighting baggy greens. He successfully saw his side over the line and concluded on 44*which ensured Pakistan broke Australia's 34 match undefeated streak in World Cups that day. He was given the MOM award during the post match presentation ceremony. In Pakistan's opening match of the tournament the skipper stole the headlines by running through the Kenyans. He bowled with accuracy, control and confidence and had somewhat found that magical spark to his bowling once more in doing so. It was a record breaking performance from the enigmatic personality as he claimed his 4th 5 wicket haul on the 23rd of February. Defending just 184 Pakistan required wickets and the skipper led from the front by single handily turning the game on his head with his uniquely canny in form leg spin which left the associate nation absolutely puzzled and answerless. Afridi had 14 wickets in 3 matches after claiming his 2nd 5 for of the tournament as he led Pakistan to a 46 run victory which kept their position at the top of the Group A Table at this moment in time. After grabbing on to an excellent catch at Mid Off to dismiss Chris Gayle the talisman once more produced a match winning spell of bowling in a crunch match. This included dismissing Pollard and Thomas in consecutive deliveries during his 27th over as his side dismissed the West Indies for just 112. This added to his tally as Boom Boom Mania dominated proceedings. After taking on the responsibility with the new ball Umar Gul produced the goods and bowled exceedingly well against the defending World Cup champions. He bowled with purpose, intent, firepower, control and accuracy. Having been awarded a Grade A contract the pacer raised his performance when it mattered to claim his 3rd consecutive 3for as Afridi's men bowled out the Aussies for just 170 odd. Having notched up an unbeaten half century to guide his side over the line against Zimbabwe in his World Cup debut the Karachi middle order batsmen followed this up by performing against the big boys. He looked compact, tough and in full command at the crease as he played some elegant shots off the blade. Unfortunately he felt agonisingly short of another half century but one cannot take away the maturity and class he demonstrated during his stay at the crease.